Our products give you a clear view of the outdoors without compromising your privacy from outsiders. As a mesh screen product, MAJESTEC™ allows the free flow of air and circulation for your comfort. Energy efficiency in term of air conditioning and electric fan consumption. Able to block at an average of 60% of harmful UV rays. MAJESTEC™ Security Doors & Windows provide a security barrier against unlawful entry into your home to deter and discourage intruders. MAJESTEC™ mesh provides protection from flies, mosquitoes and other pests. Our products are more durable and stronger than ordinary screens. 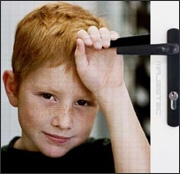 Designed with both security and real world use and applications in mind, our lock system and handle help prevent burglars whilst providing home owners with ease of use, entry and exit. Above all, MAJESTEC™ Security Doors & Windows are made strong, secure and durable to provide you years of trouble free use at a minimum of after installation care. MAJESTEC™ Security Doors & Windows are not only made to be strong, but also to enhance and modernize the architectural appeal of your home. There is no compromise with aesthetics as with conventional bar & grille systems. MAJESTEC™ products are easily incorporated into almost all types of doors & windows at a minimum of fuss and hassle and come in a multitude of color options to suit your personal needs and tastes.